On 27 September 2009, human rights defender Adolfo Ich Chamán was brutally killed. Seven years later, his wife Angélica Choc is still struggling for justice. Adolfo Ich Chamán was a respected Mayan Q’eqchi’ community leader and the President of the Community of La Uníon in the El Estor region of Guatemala. Before being killed, Adolfo was leading his community in the struggle against a Canadian mining company destroying their territory. He was speaking out against the human rights violations committed by the company and the negative impact of the mine in his community. In the early afternoon of 27 September 2009, Adolfo went to one of the buildings close to the mine. He had heard some gunshoots, and he wanted to make sure violence between the anti-mine protesters and the security guards would not escalate. He was not carrying any weapons. When he arrived there, a group of men working as security guards for the mine attacked him with a machete and shot him in the head. He died from the wounds. The same day, security personnel working for the mine shot at close range another community member, German Chub Choc. He survived the attack, but he suffered life-threatening injuries and he is now paralyzed. Following her husband's killing and the attack against German Chub Choc, Angélica Choc along with 12 other plaintiffs sought justice in a Canadian court. They sued the mining company HudBay Minerals Inc. and two of its subsidiaries, HMI Nickel Inc. and Compañía Guatemalteca de Níquel S.A, for the death of her husband. The case is still ongoing, but its presence in the Canadian justice system has already set an important precedent. In the past, Canadian courts have only accepted cases related to Canadian companies themselves – not their local subsidiaries. Effectively, Canadian companies used to be able to absolve themselves of blame for crimes committed by their Guatemalan subsidairies. This is no longer so. According to the Canadian lawyers who are working on this case, the mining companies “have repeatedly referred to these land claimants as squatters or invaders, and have to date refused to recognize or accommodate Mayan Q’eqchi’ claims to the land”. The conflict in the region of El Estor dates back to 2006, when Mayan Q’eqchi’ communities began reclaiming their land. Community members started reoccupying their ancestral territories, land from which they were violently evicted during the civil war from 1960 to 1996. In late 2006, the mining company HMI Nickel (at that time called Skye Resources) requested local police to evict the indigenous communities. Private security forces and Guatemalan police officers burnt hundreds of houses, attacked the villagers, and raped several women in the community of Lote Ocho. In March 2015, Angélica also took the lead in a high profile criminal trial in Guatemala against the mining company's former security chief, Mynor Padilla, who is also a retired Guatemalan army agent. 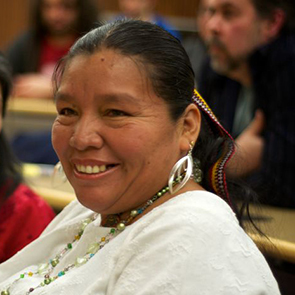 Because of her role in speaking out against the abuses committed by the mining company, Angélica has suffered attacks, threats and intimidation. In the latest attack, on 17 September 2016, four shots were fired outside her home while she and her two children were sleeping. The continuous acts of harassment and intimidation against Angélica are not stopping her. A week after the latest attack, she held a cerimony to commemorate her husband's life, work, and murder, and to send a clear message to those still terrorising her community: she will keep fighting for justice.